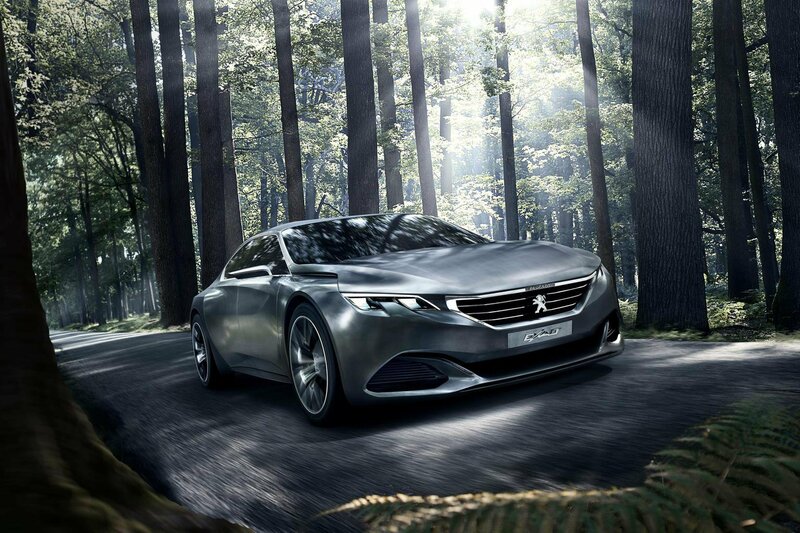 Peugeot Exalt and Infiniti Q80 concepts make debuts at Paris Motor Show | What Car? The Peugeot Exalt concept car has made its European debut at the Paris Motor Show, and showcases the company’s design and engineering vision for its future production models. Exalt is a large four-door saloon and uses hybrid technology in the form of a 1.6-litre 266bhp petrol engine combined with a 67bhp electric motor to drive all four wheels. The system automatically switches between either power source, or combination of the two, depending on the driver’s particular needs. First shown in Beijing earlier this year, this updated version of the concept demonstrates Peugeot’s philosophy of local material sourcing - for example replacing the Chinese-spec ebony interior trim with ‘Newspaper Wood’, created from recycled newspapers. Interesting materials are employed throughout the design. The majority of the exterior bodywork is finished in bare steel, and this gives way to a Shark Skin textile finish at the rear, which is used to aid the aerodynamics. The i-Cockpit dashboard is similar to the design used on the production 308, with the instruments set high above a small steering wheel. Next to these, a large central console incorporates two folding touch-screens. The upper one is used to operate features such as the sat-nav and stereo, while the lower screen is for the Pure Blue air-con. When the car is not in use this system sanitises the cabin surfaces and filters the air when on the move, ensuring a purified cabin environment at all times. At the rear, a pantograph mechanism on the tailgate creates a wider opening to give easy access to the Hybrid-kick Concept – a foldaway electric scooter that is stowed beneath the boot floor. The Infiniti Q80 Inspiration concept has also made its debut at the Paris Motor Show. The Q80 points towards Infiniti’s ambitions to take on the established players in the upper-premium luxury market, such as BMW, Jaguar and Mercedes. Using a low-slung fastback body, the concept has seating for four, and if built, would sit above the recently launched Q70 in the range. Although few details have been released at this stage, Infiniti is hinting that the Q80 will be designed as 'a car to drive rather than be driven in', and at least match its rivals in terms of in-car technology.